1. Provide information and analysis to help inform readers about local issues. 2. Advocate for traditional neighborhoods which house people of all ages, races and incomes, with walkable neighborhood schools and tree-lined streets -- safe and attractive for pedestrians, bicyclists, and motorists. 3. Encourage Pottstown Borough and the Pottstown School District to conduct their business in an open and professional manner. 4. Make the best and most efficient use of community assets. We do this through our Web site and through biweekly columns published in The Mercury as paid advertisements. 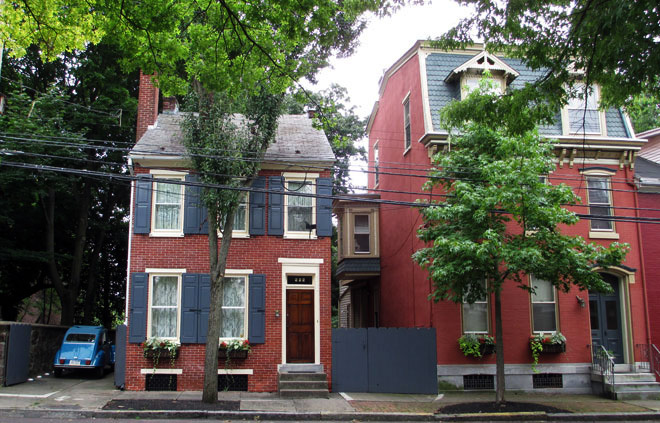 Tom Hylton, treasurer and Web site editor, has lived with his wife, Frances, in an 1870 brick house at 222 Chestnut Street in downtown Pottstown, next to the Potts Family Burial Ground, for more than 40 years. They also own the neighboring apartment house at 220 Chestnut Street, where Tom's mom lived the last five years of her life. Frances retired in 2008 after 35 years as an elementary school teacher in the Pottstown School District. During his first 22 years in Pottstown, Hylton wrote for The Mercury. In 1983 he conceived and organized Trees Inc., a non-profit which raised $500,000 to plant and maintain street trees in Pottstown. The following year he co-founded Preservation Pottstown, a non-profit dedicated to preserving Pottstown's architectural heritage. That organization has evolved into the Mosaic Community Land Trust. In 1990, he won a Pulitzer Prize for editorial writing. He resigned from the newspaper in 1994 to form a small non-profit and write a book about ways Pennsylvania can preserve its towns and countryside. Later he produced and hosted a public television documentary based on the book that has aired more than 100 times on PBS stations nationwide. Hylton served eight years on the Pottstown School Board, 12 years as chairman of the Pottstown Planning Commission, and 15 years as chairman of the Pottstown Shade Tree Commission. He was recently appointed to an unexpired term on the school board ending in December 2019. This Web site was established in December 2008. Columns written for The Mercury have been published as paid advertisements. The columns are used as a forum to promote the best aspects of Pottstown as a sustainable community. We believe these columns help promote good government and preserve Pottstown's core strengths, which include walkable, tree-lined streets and neighborhood schools. Freedom of speech is a precious right which can make our communities stronger.